The kids are sooooo excited about our teddy bear picnic. They have been working hard all week on teddy bear items. We have everything ready to go for tomorrow and can't wait to share pictures and our Teddy Bear Unit with you all!! It has been a fun unit this week!! Lots of pictures to share with this fun unit this weekend!! Some of you asked for me to share the donation form that I send home...so here it is! Let us know if you grab our freebie. Spring break starts tomorrow at 3:30. Can't wait to relax and hit my to do list!! 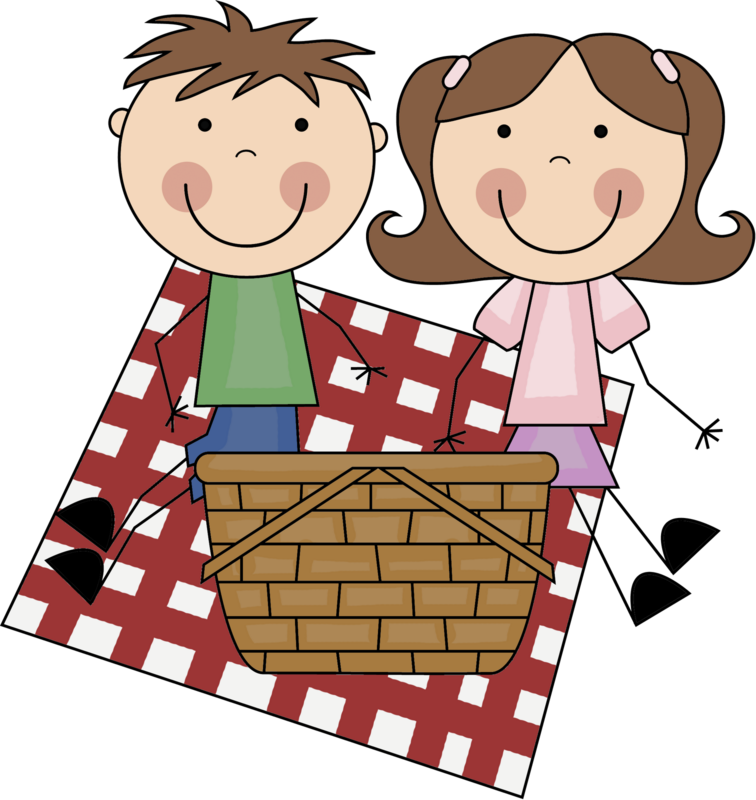 Our teddy bear picnic is almost here. Only 2 more days!! The kids are so excited for this special day. Today we made our picnic "tablecloth" so that we can prepare for teddy bear picnic pictures and of course our teddy bear snacks. The kids did a great job with coloring an AB red/white pattern. Tomorrow we are going to make our teddy bear headbands, do some gummi bear sorting/graphing, and continue with some teddy bear writing. I am also hoping that we will get to do a fun "BUILD A BEAR" project tomorrow, too. A lot on the plate, but 2 days before spring break, so I gotta keep them working really hard. Added some new applications on the ipads/ipods today and you would have thought they won the lottery. It is so fun to let students explore with some of the games because they actually figure the ones out for me that I didn't have time to critique, yet. Think this is great problem solving skills and it takes things off of my plate!! ALL FOR THAT ... taking things off my plate!! Some of you have emailed asking for our teddy bear donation note. We will add that tomorrow as a freebie. 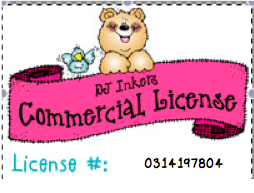 This post we are giving a freebie of what I used for the teddy bear invitation. There are 3 copies provided for you. The first copy is a whole page and all colored. The second copy is some color and can be trimmed to have a scrapbook border which might be cheaper if you are paying for your own colored printing. The last one is one that is colored, but has 2 on a page instead of a whole sheet. 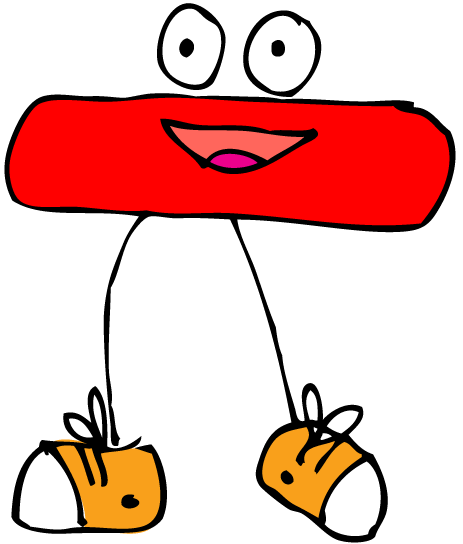 I used this version for my kindergarten scrapbooks. I have a volunteer coming in tomorrow who is going to get my scrapbooks caught up. I will share what they look like over our break. 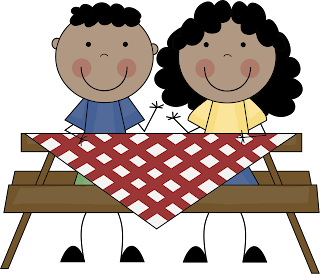 Over our break, one of the things we plan on doing is posting Our Teddy Bear Picnic unit along with at least one other unit. We do want to enjoy our spring break, too!! Check back tomorrow on more teddy bear ideas. 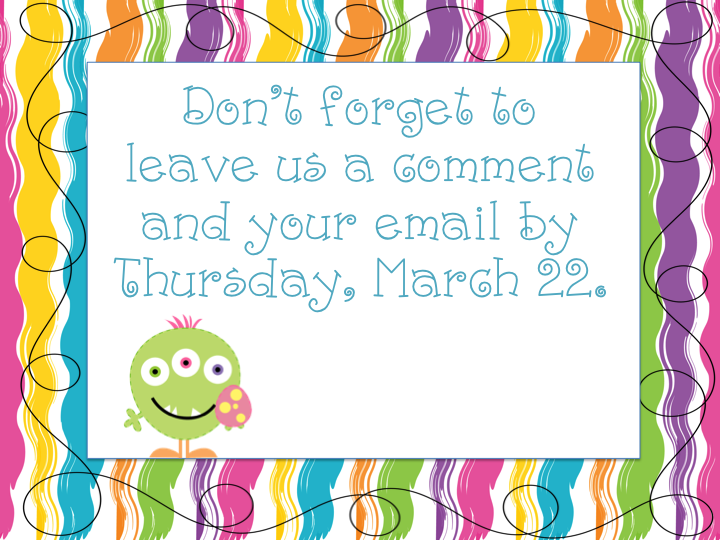 If ya grab our freebie, we would love to hear from you!! 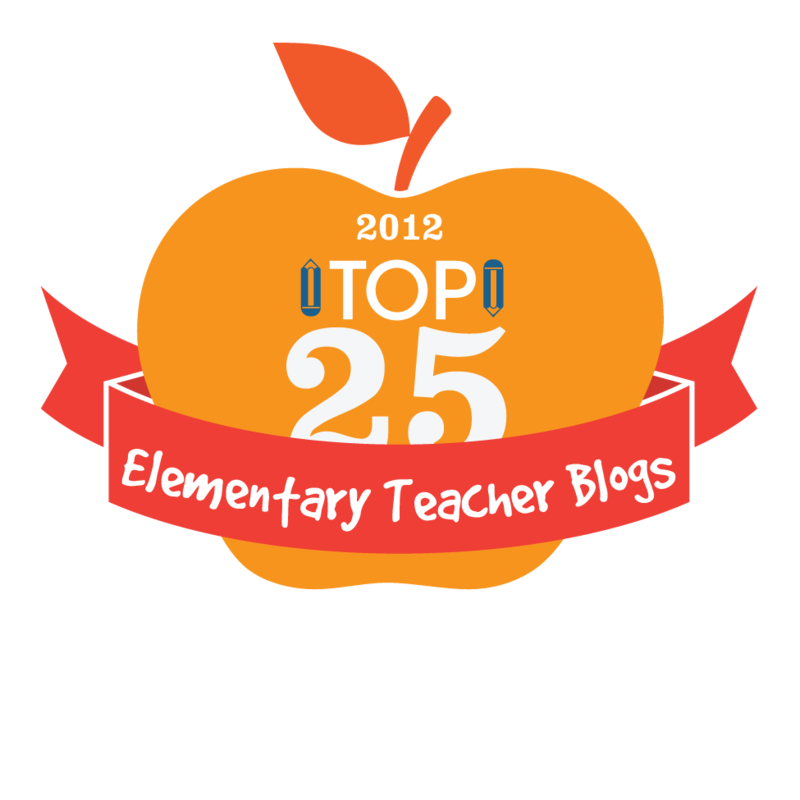 Check out yesterday' post, March 27, about our April Math Journal being posted on TPT. Copied mine today and stapled them in less than 10 minutes. No cutting or gluing. Already to go until May. April Math Journal (click here to go directly to TPT) is up and loaded on our TPT store for $2.00. These math journals are jammed packed of common core standards for the kids to solve. They are so easy to copy, just pop it in the copy machine and staple when done. I have the kids read it on their own first. Then we read it together. Next we circle important words that will help us solve the problem one step at a time. I started using the word "fluff" with the kids. This means it is written in the story problem, but we really didn't need to know it. Oh my goodness, my kids think that word is a hoot. They will say, oh that is just fluff. We don't need to know that the birds were in the tree. We just need to know that there were 13. TOO CUTE!!! We started using the word "fluff" in our reading. That was just giving us more information, but let's get down to the main point!! This is NOT FLUFF...We have spring break in 3 days and we are Not Counting!!! Just started this week to really dive into the composing and decomposing standard. We have been hitting it some the last couple of months. I was really impressed at how well the students were doing with starting with that base ten block and counting on the ones. We started with the composing part of numbers first. 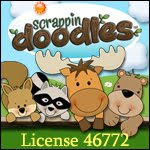 We have a packet called Number Sets Composing Numbers To 20 (click here for direct link to TPT) on our TPT store, too. We just started with the book on Monday and do 1-2 pages each day. I just printed and laminated the center cards today to start those centers when I get back from spring break. We will do some of the large group activities the rest of this week from this packet. One of my Bowling Green University students worked individually today with the students on this concept. She used some composing cards from our Spring Into Math Packet (click for a direct link to TPT) which has some composing items. She said the students were really understanding this concept!! YEAH!! 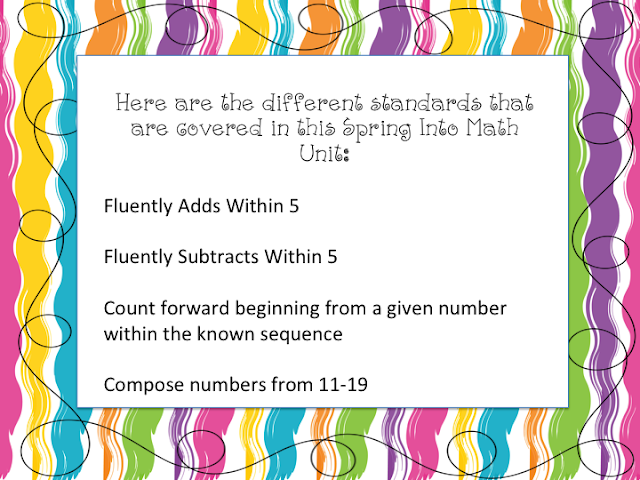 Our April Math Journal is up should be up tonight, Tuesday, March 27 and ready on our TPT store. We finished it up this weekend and have had server issues the past 2 days. School computers running really slow and won't let us get on the server!! These journals are sooooo easy to make. You just pop the pages into the copier and put a staple in the top. Some teachers said that they have even been putting these Math Journals in their centers with their Talk Points. I received Talk Points through a generous grant through my school district and plan on giving this a whirl this month of April. The last couple of years, we have switched from the tradition Easter egg hunt for the kids to a Teddy Bear Picnic. 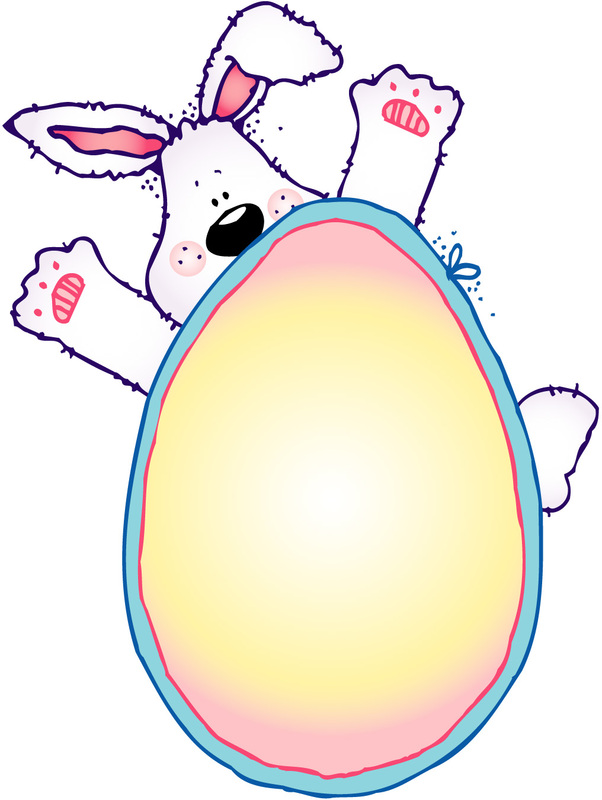 We used to have kids bring in the plastic Easter Eggs and tons of chocolate. 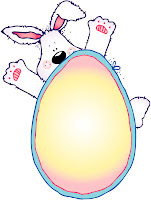 It took us forever to put the candy into the eggs and the kids were wound up with all of the chocolate. Another downfall was, as a teacher, I always found myself putting my hand in the chocolate basket every time I walked by it. So, 2 years ago we decided to do a teddy bear picnic on the last day before our Easter break. 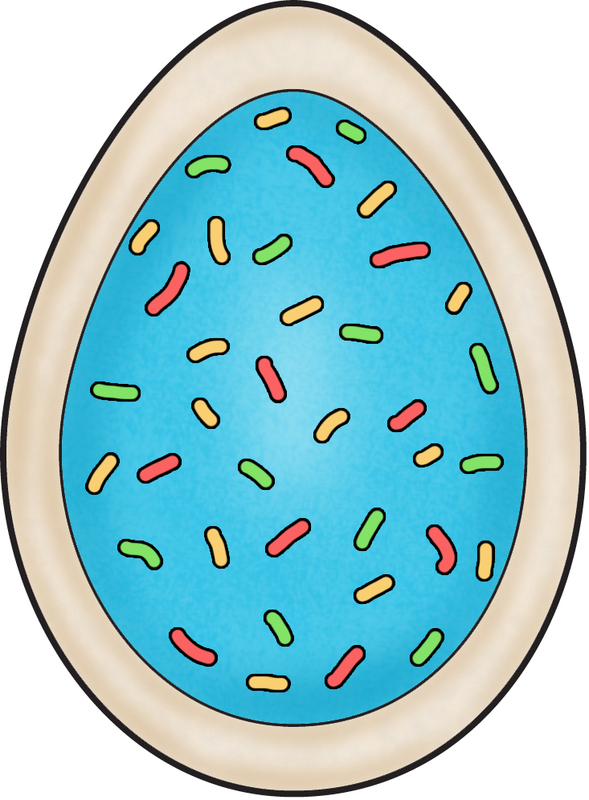 It worked wonderful and the kids/parents loved it even more than the traditional Easter egg hunt. We sent a letter home Thursday with every student explaining our Teddy Bear Picnic and asking them to donate something from a given list. These donation papers were returned the next day and we confirmed back what they were to bring by Wednesday of this week. 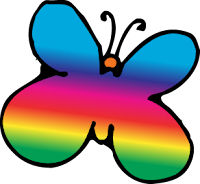 This allows you some time to "run out" and get something that you need. At this point, the only thing I need to get are those Strawberry Kool-Aid water packets that the kids will put into their water bottles. Watch for Fun Teddy Bear Activities All Week. 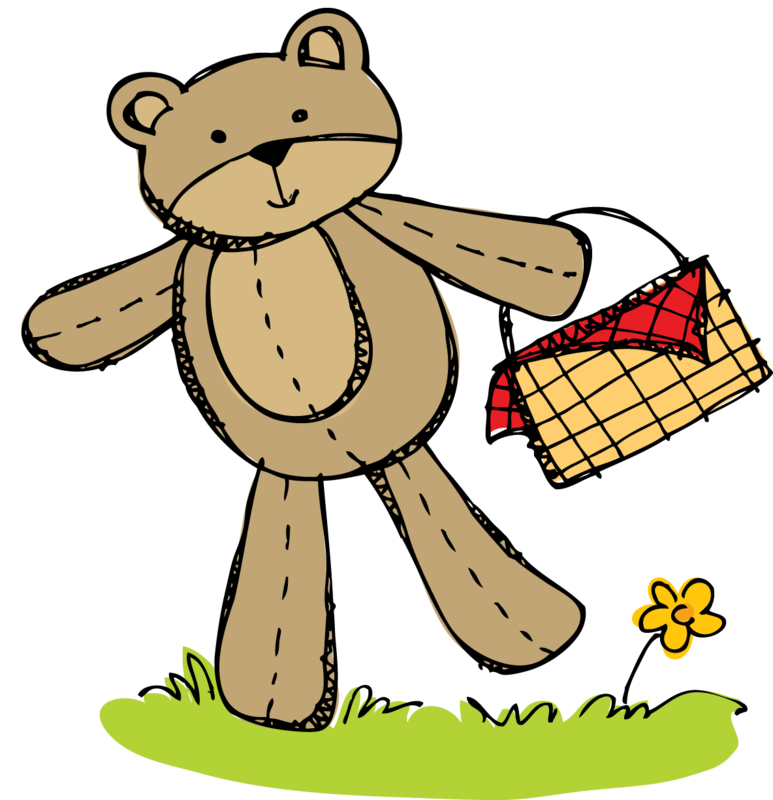 We plan on having a Teddy Bear Picnic Packet Up During our Spring Break so that our projects and pictures will be finished. You can do your teddy bear packet this spring and maybe give it a try next year during spring break!! Our kids are getting excited about their BYOB for Friday. This stands for Bring Your Own Bear!!! They will get their invitation to their Teddy Bear Picnic tomorrow. Again, we will post again today after school, and our April Math Journals should be up after school today!! This student is counting the frog "eggheads" and duck "eggheads" fluently to 10. We differentiated the activities by some students working on fluently adds to 5 and fluently adds to 10. She is working on the challenging activity of fluently adds to 10. Here is a close up of this "egghead" addition activity. Same exact concept and differentiation, but with subtraction. This student is also working on the challenging center by subtracting fluently to 10. Another student working on some bunny addition with another Spring Into Math Center Packet. Yum, yum. This center has "Spring Cookies" that they are subtracting. This student said counting the carrot cookies made her stomach growl. HOW CUTE!! These are just a few pictures of what I took on working with our Spring Into Math Activities. 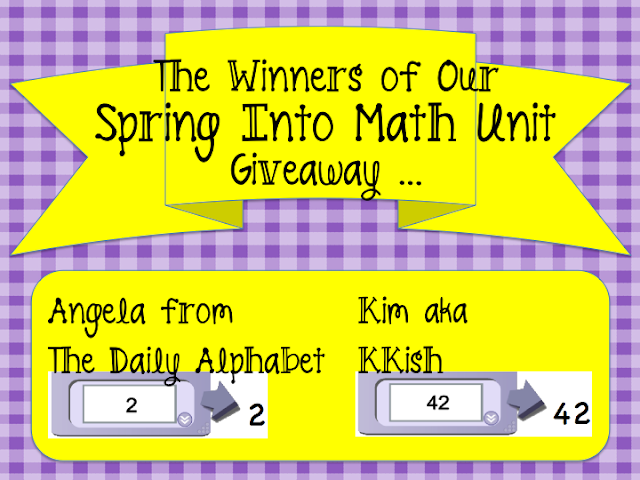 Click here to take you right to the link on our TPT store~Spring Into Math Unit. You get all of these great common core standard activities for $7.00. 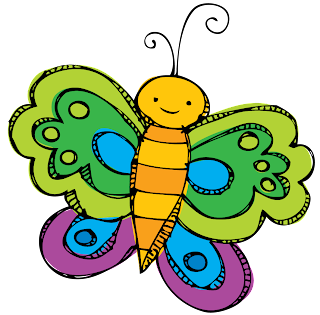 Just wanted to remind you to head over to Jamie's blog, Mrs. Mayas' Kindergarten(click here to go directly to her blog), to sign up for Jamie's Spring Giveaway that we are participating in with her. 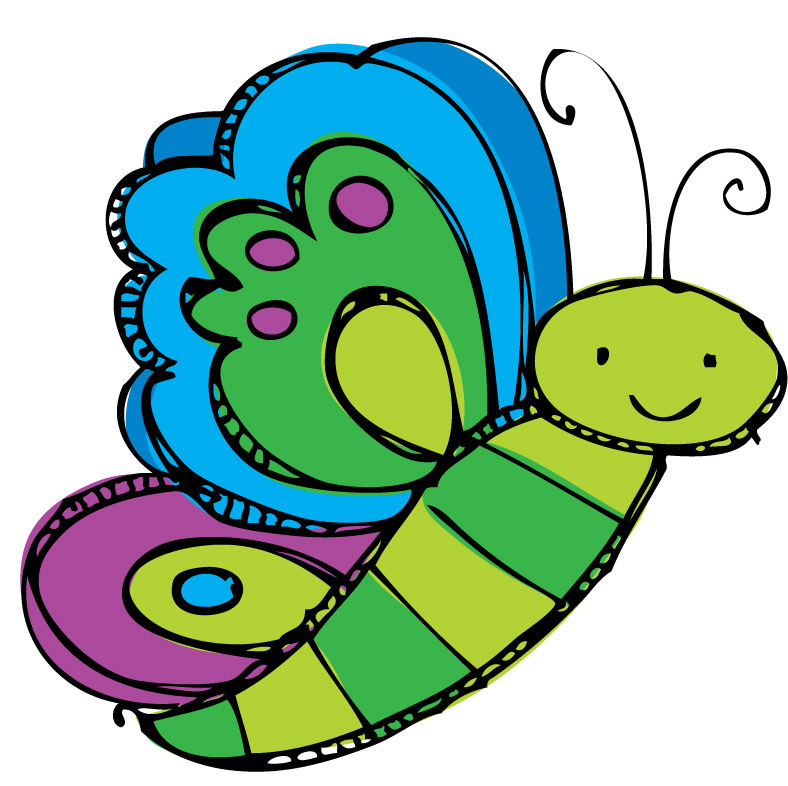 SueBeth and I just finished and posted our Spring Into Math Activities Unit (click here to check it out) on our TPT store. You will have to check this unit out. I am laminating and cutting out the unit tomorrow so that we can start it on Wednesday. It is filled with tons of end of the year Kindergarten Math Standards. TONS of pictures, soon!! I had the push on tonight after my 2 hour nap. I guess I must have been tired from the weekend!?! I got taxes ready for my husband...kind of embarrassed how much you spend each year in school!! 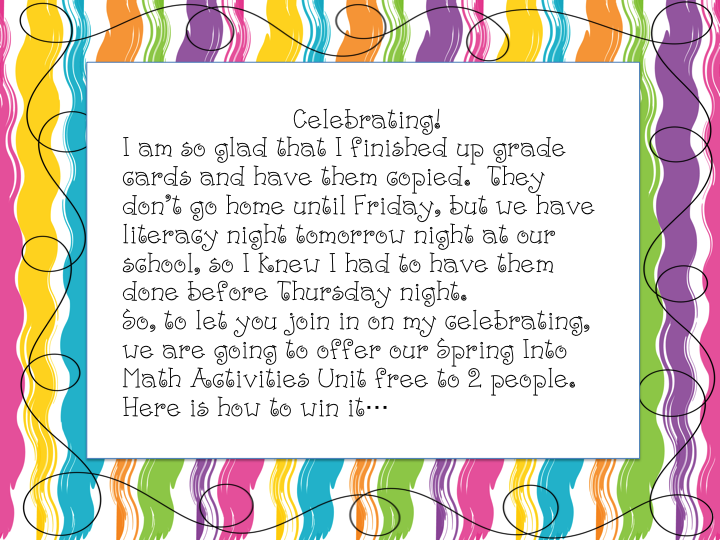 SueBeth and I wrapped up our Spring Math Unit. I finished 1/2 of my grade cards, and made up my to do list for tomorrow since I have 2 parent volunteers and 2 College Observation Students! Hard to believe that tomorrow is the first day of Spring. Ohio weather is almost summer like weather now...not complaining as long as it stays and is this beautiful for our spring break in about 11 days...but who is counting!! 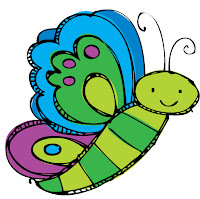 ENJOY YOUR FIRST DAY OF SPRING!! 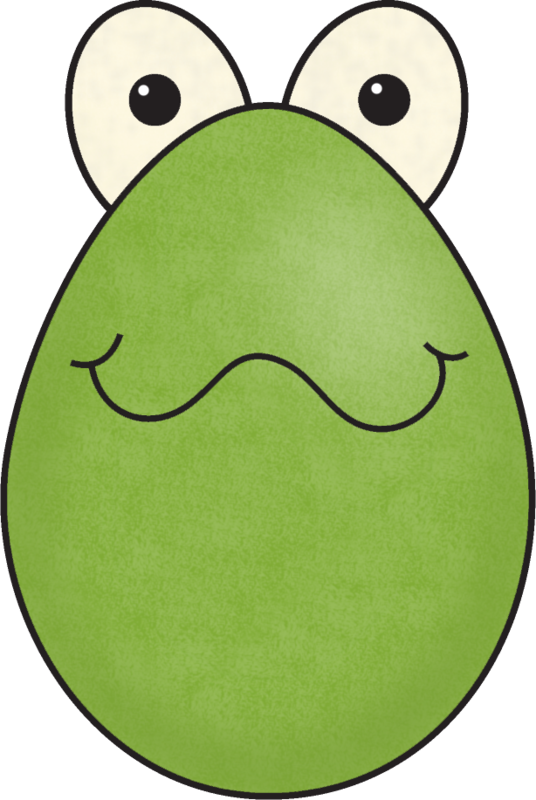 Well, another St. Patrick's Day is under our belt. The kids had so much fun this past week with several projects. 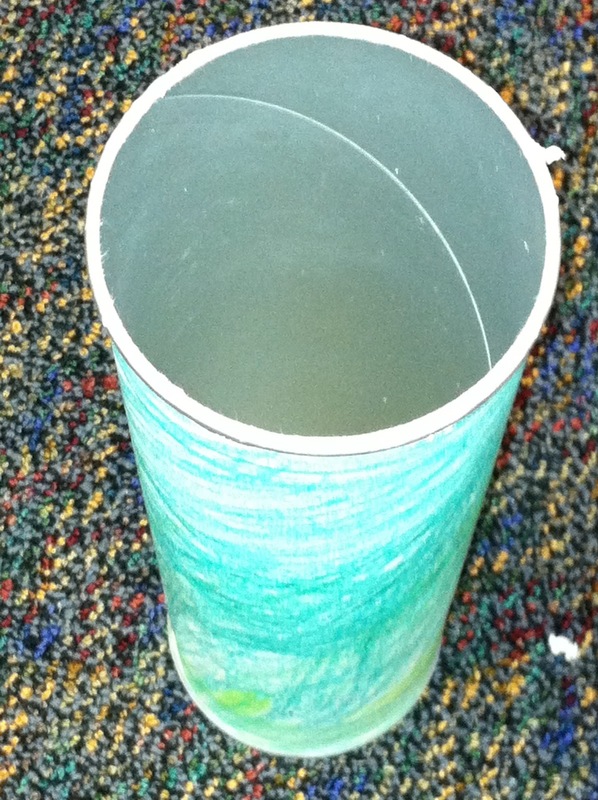 We posted a leprechaun trap note that was sent home a week ago with the students on making a trap at home. Here are some of the traps that the kids made at home. Tons of green, glitter, gold, and Lucky Charms to help us try to catch that leprechaun. Gotta love ya a little gold glitter and Lucky Charms. 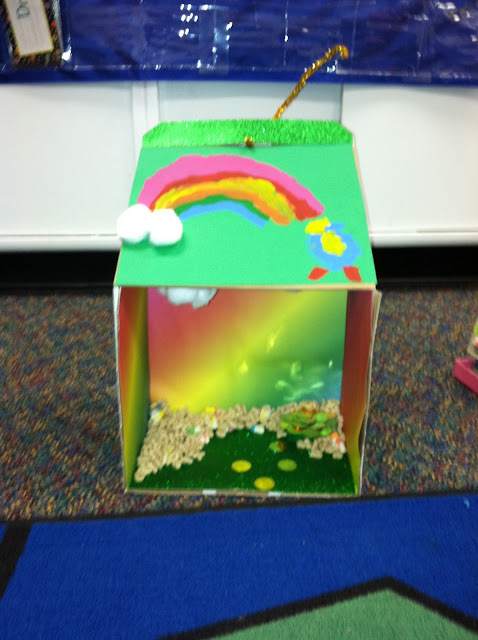 Inside of this trap was gold to help lure the leprechaun into the trap. 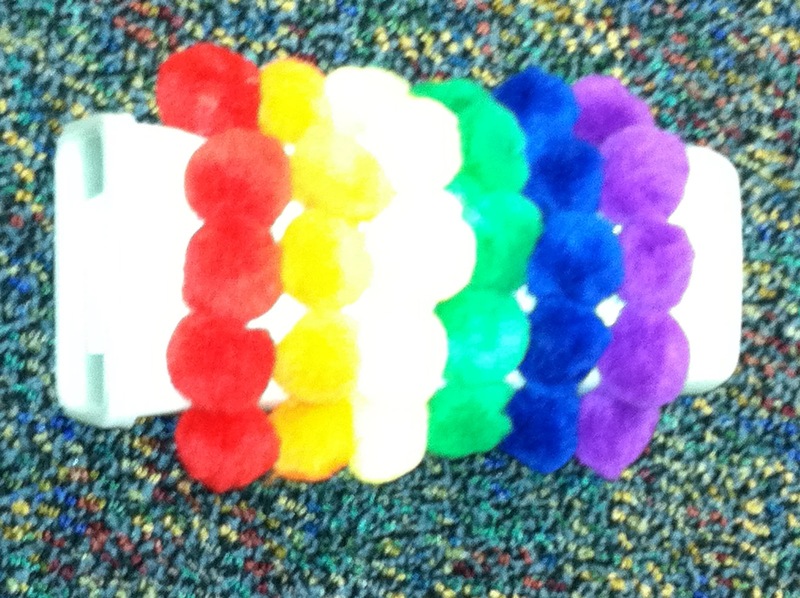 Pom-poms were used to represent the colors of the rainbow. A hole was cut in the top for him to get caught. 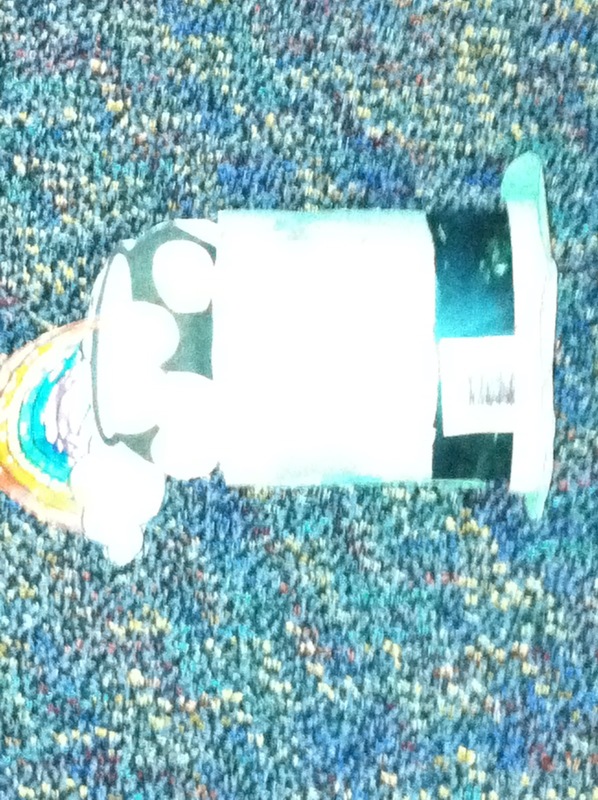 This "Pringles" can had gold on the inside to help trap the leprechaun. This student put gold beads inside the trap. 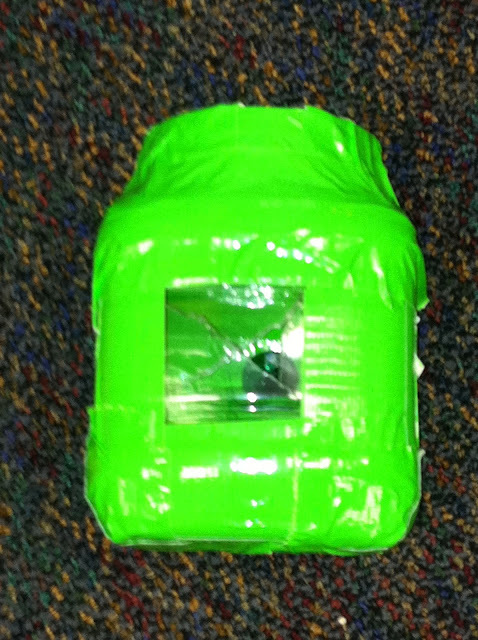 Green duct tape was used to help this trap look green. Inside the trap was different things for the leprechaun to enjoy. This leprechaun hat trap was cute. It had a hole in the top with gold coins. Students were enjoying their rainbow sherbert while SueBeth and another teacher's daughter were "messing" up our room for the students to think the leprechaun had arrived. Our room was "trashed" as we came back into the room. As SueBeth said, nothing took us too long to put back together. But it was trashed. I should have taken pictures of their faces when we came back into the room. The best part was they took my Cat In The Hat and hung it up on the ceiling. The kids thought this was the best!! It's hard to believe that our 3rd 9 weeks ended Friday. 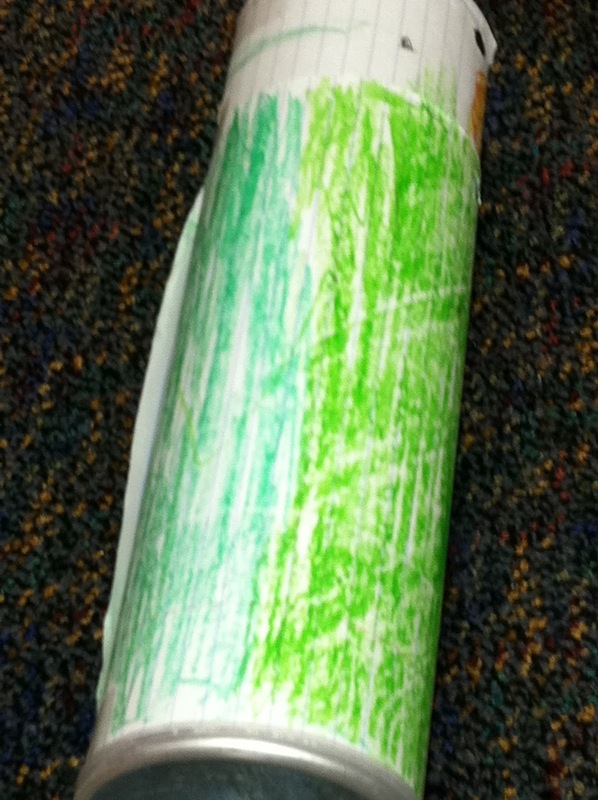 We wrapped up our subtraction unit. My students loved all of the subtraction centers that we have done the last 2 weeks. 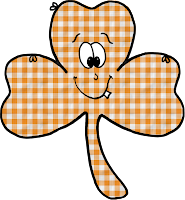 I assessed them again Friday, of course before the leprechaun came, and they did awesome on their assessment for their grade card. For our assessment, the students have to solve subtraction problems without any help, but they can use some kind of manipulatives if needed. 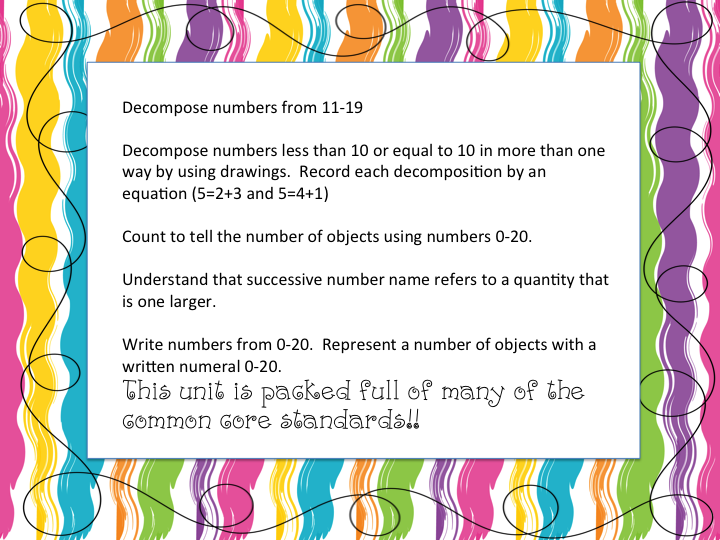 Now this week, we are going to start working on mastery of counting objects and writing numbers to 20 and decompose/compose numbers to 19. 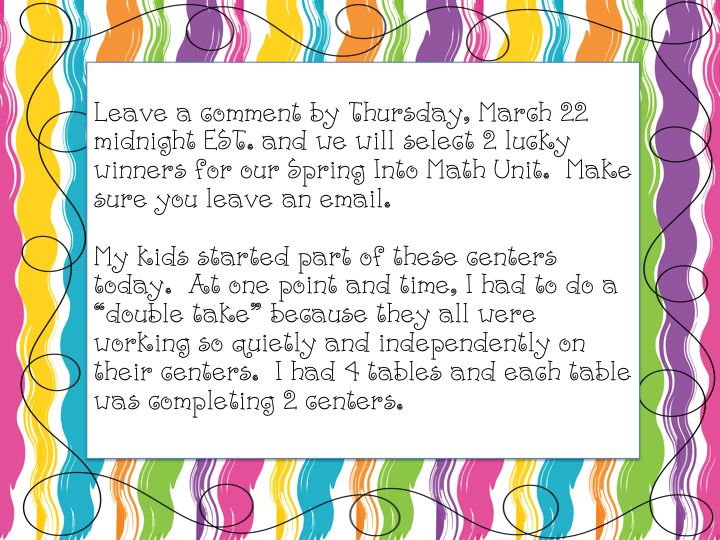 Jamie over at Mrs. Mayas' Kindergarten asked us to join her for a great Spring Giveaway. Head on over to her blog to get yourself a chance to win some great units. Our unit is going to be a Spring Math Unit that we are finalizing this week. SPRING HAS SPRUNG in OHIO. We are enjoying the sun and 74 degree temperatures!! 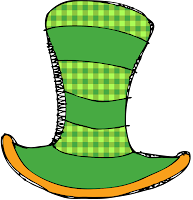 Here is a freebie subtraction St. Patrick's Day center that you can use either this year or next year. 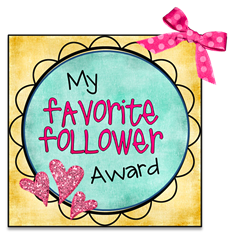 Let us know if you grab this freebie...we love your comments! 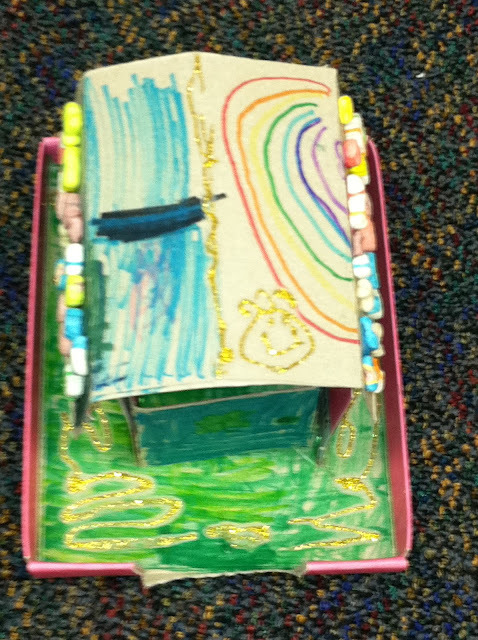 I sent a leprechaun trap note home with my kids last week. I talked with the kids about the leprechaun trap and that it was totally optional. According to my note tomorrow is the first day that the kids could start bringing them in because I didn't want to be tripping over them for several days. However, out of my 21 kids, I would say that at least 7 kids brought them in between yesterday and today. It truly amazes me how clever the students have been at thinking out how they could make a trap for the leprechaun. 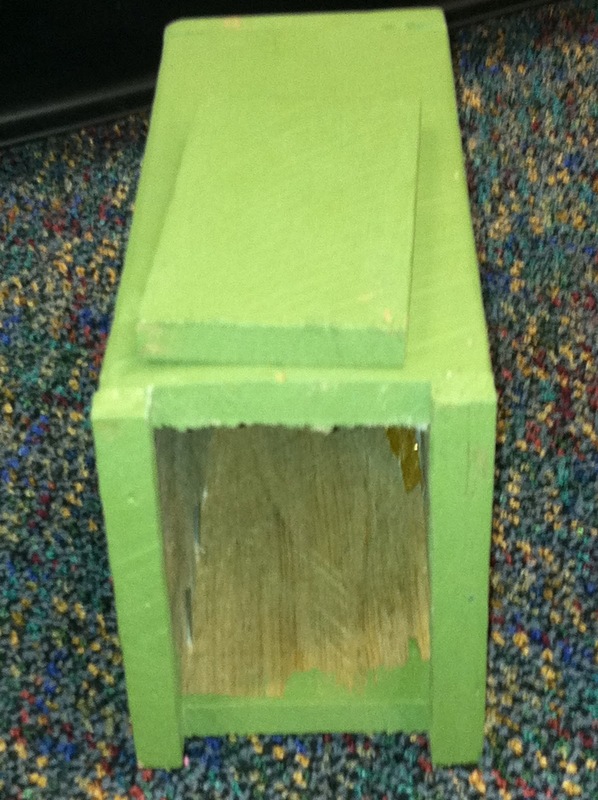 They used their prior knowledge about what we have learned about the leprechaun to design these traps!! I will definitely have to share these traps with you. 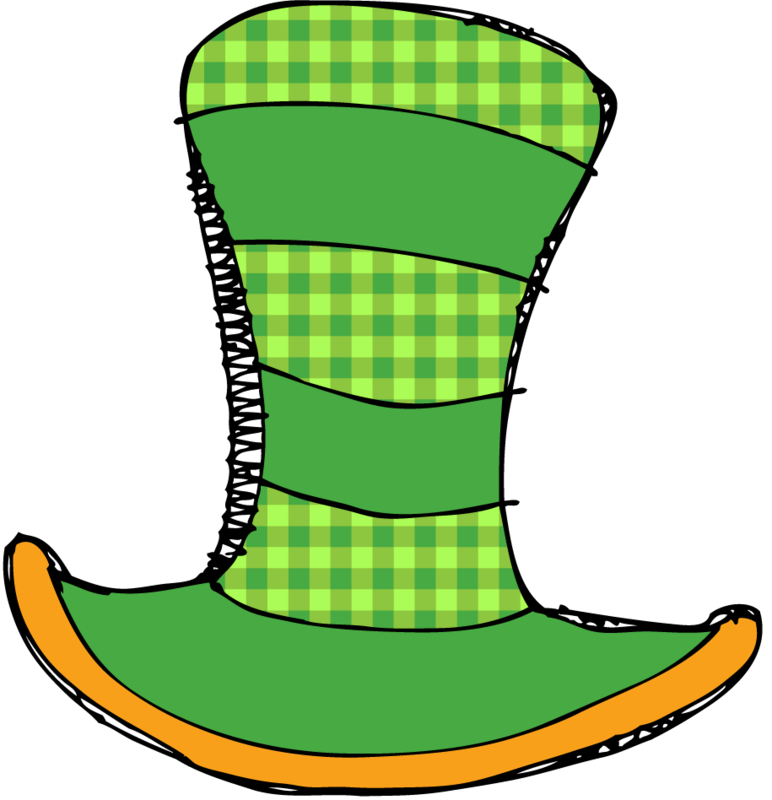 Learning about the leprechaun and St. Patrick's Day has definitely driven my journal writing this week. They have written so much about the daily topic. My plan is for the kids to set their traps Thursday to see if we will catch him over the weekend. 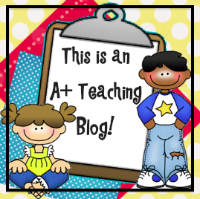 Be sure to snag a copy of this freebie note for next year. Sorry about not getting it to you earlier, but it has been a crazy week at home. By the end of Saturday, I will have been to at least 6 basketball games in the last week for our high school. 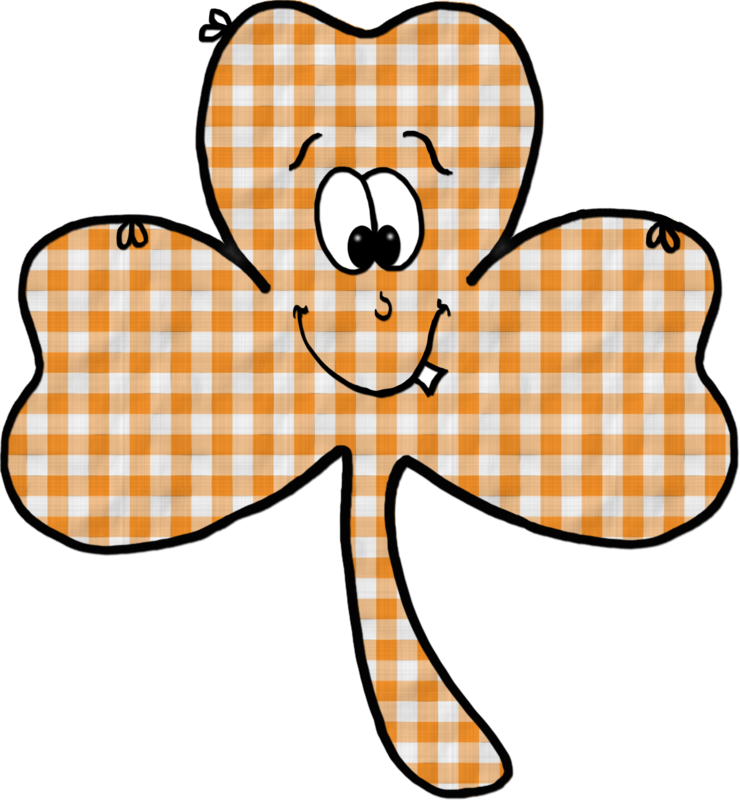 The kids have loved the book There Was An Old Lady Who Swallowed A Clover. These fun activities can be found in our Lucky Literacy Packet at our TPT store.We have done some rhyming with this book, word family work, retelling of the story, sequencing events from the story, and a "shape" art project of The Little Old Lady just to name a few. Thanks to SueBeth coming to my room yesterday, she took pictures of my kids working hard on their art project of the Little Old Lady. We reviewed a lot of 2-D(flat) shapes through this art project. I plan on wrapping up this unit next week. Lots of pictures coming soon on these projects!! Students concentrating on putting the head close to the top so that everything fits on the paper. We have been focusing on using less glue as one of our March goals. We did better!! Discussed a lot of 2-D shapes during this art project. Great review since the beginning of the year. Students chose what color of shirt and socks they wanted for the Little Old Lady. We are wrapping them up tomorrow. We will be adding lace and pearls tomorrow. 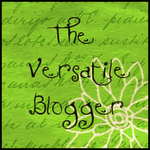 We will also finalize this project by completing a writing project! Let's just say it has been a busy/crazy week!! We finally had our first snow day off on Monday. Wednesday we had a planned 2 hour delay for teacher inservice. Today it rained most of the day so the kiddos had an indoor recess, and we are finalizing things for our 3rd nine weeks. I can't believe that the 3rd nine weeks is almost over!! WOW~where has this year gone? Well, tomorrow I need to assess the kids one more time over the standard of counting objects 1-10. So, here is the worksheet that I will be using tomorrow as an assessment. 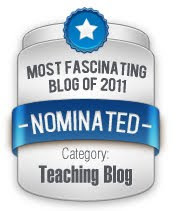 You can use this as an assessment, as a practice worksheet, or as a review in a center. Check back this weekend, we should have more freebies and more items up on our TPT store! I didn't know if the kids were going to do well with our big formal subtraction unit or if they were going to have some confusion with the concept. We have talked about subtraction the whole year long. We have been solving subtraction problems in our monthly math journals and it always appeared that the kids got it. I was keeping my fingers crossed as we started our big unit today. We did a small mini unit together to review the concept. Then I explained a subtraction center that they were going to complete before doing a review center. The kids did an outstanding job and it was truly amazing how well they were counting the groups, taking away, and then coming up with the difference between the 2 numbers. Not one child raised their hand for me to help with the concept. Here are some pictures of our subtraction math centers we did today. We got to enjoy the illustrators Jeanette and Christopher Canyon today during an assembly. We have been reading books to the students for about a month. They were soooooo excited when they got to see them in "real life". They are from Columbus, Ohio and it was an outstanding performance from them. If you are looking for some great illustrators, look them up. WONDERFUL PRESENTATION!! 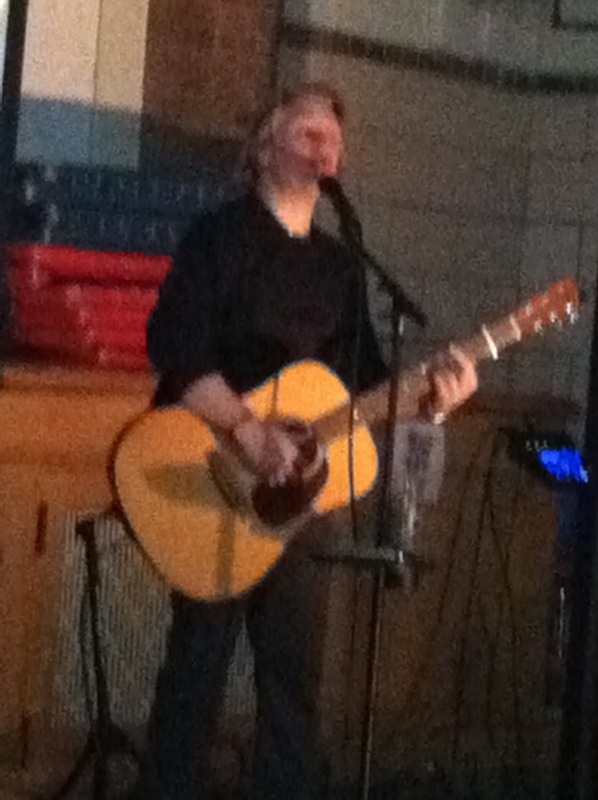 Sorry about the blurry picture. 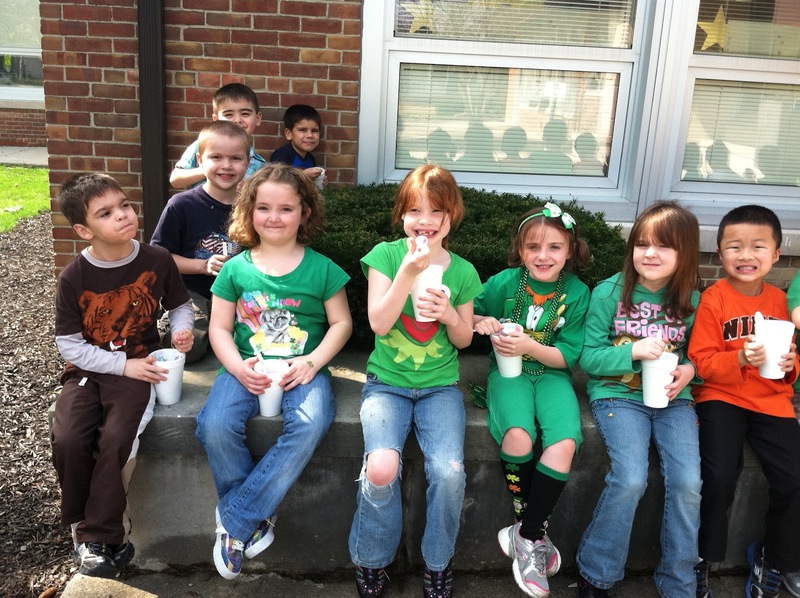 After math centers today, we celebrated 100 years of the OREO cookie by each student getting to eat an OREO cookie. One of the teachers knew it was 100 years old today, so she ran during her planning period to buy OREO's for all classes. I got a lot of hugs at the end of the day for this special treat!! That OREO was delicious!! They were trying to twist my arm for another one!! This group loved their cookies, too!! Happy 100th Birthday, OREO COOKIES! !